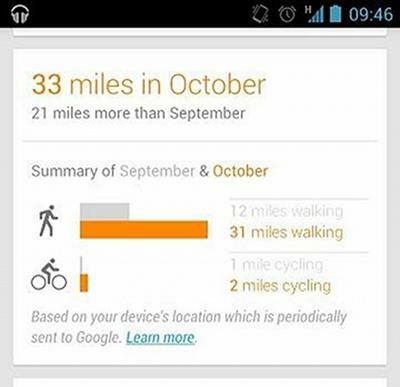 Google has quietly issued an update to Google Now that introduces a handy new feature to track how far you've been walking and cycling. It presents your results for the past month, and lets you compare your progress with previous periods. There isn't a Google Play update for this feature, so you don't have to do anything manually to get it. Simply open up Google Now on your Android-powered smartphone (you'll need Android 4.1 Jelly Bean), and you should see the new 'card' automatically. It's unclear how Google Now keeps track of this information, or indeed how accurate it is. Presumably, it uses your handset's location data and built-in GPS, so you'll probably need to ensure that's active on your handset if you want to take advantage of this feature. Not every user seems to be seeing the new feature straight away: While many are reporting that they now have it over at the Android Central forums, others do not yet — and I can't see it on my Galaxy S III. Has the update reached you yet?